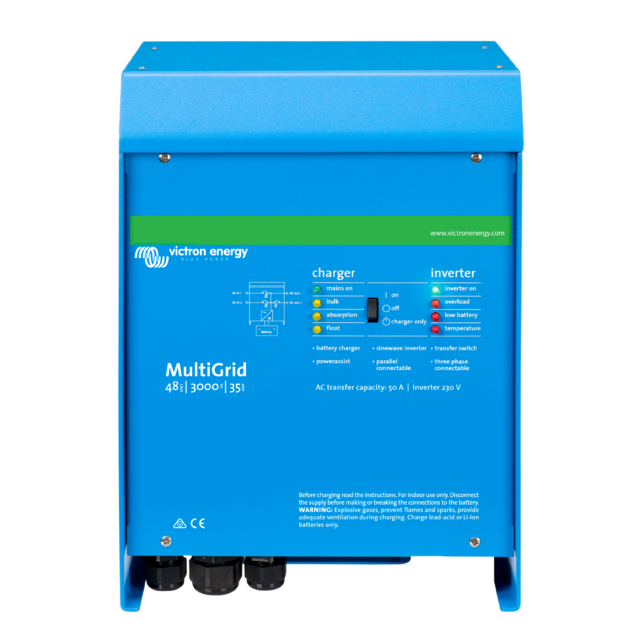 MultiGrid is the key component in a Victron energy storing systems, providing the flexibility to combine with MPPT Solar Chargers or Grid-tie PV Inverters. MultiGrid inverters significantly reduce the risk of grid instability and electricity costs by utilising energy storage and self-consumption. With Anti-Islanding built in, this makes it suitable for countries such as Germany, Austria and others. In the UK the MultiPlus is used, as it is approved to the standards required there. In the event of a grid failure, or when shore or generator power is disconnected, the MultiGrid inverter/charger is automatically activated and takes over the supply to the connected loads. Since it happens in less than 20 milliseconds, computers and other electronic equipment will continue to work without disruption. Up to 6 MultiGrid inverters/chargers can operate in parallel and achieve high power output. Three phase or split phase operations are possible as well. It is easy to monitor and control MultiGrid systems locally (LAN) or remotely via the internet from anywhere in the world, using the free Victron app and website. © 2017 SolaricaShop.com. All Rights Reserved.